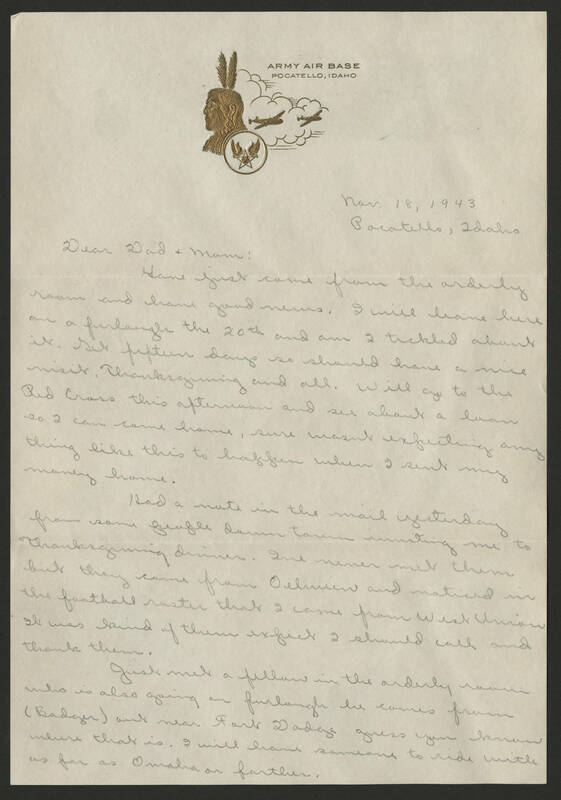 Nov. 18, 1943 Pocatello, Idaho Dear Dad + Mom: Have just come from the orderly room and have good news. I will leave here on a furlough the 20th and am I tickled about it. Set fifteen days so should have a nice visit. Thanksgiving and all. Will go to the Red Cross this afternoon and see about a loan so I can come home, sure wasn't expecting any thing like this to happen when I sent my money home. Had a note in the mail yesterday from some people down town inviting me to Thanksgiving dinner. I've never met them but they come from [illegible] And noticed in the football roster that I come from West Union. It was kind of them expect I should call and thank them. Just met a fellow in the orderly room who is also going in furlough he comes from (Badger) out near Fort Dodge guess you know where that is. I will have someone to ride with as far as Omaha or farther.